Google's Highly Open Participation Contest (GHOP) has sponsored the completion of 29 tasks for Plone by pre-university level students around the world. Thanks to Google's latest attempt to get people involved in Open Source software 29 community suggested tasks to improve Plone in various ways have been completed by a group of talented pre-university level students. There are far too many contributions to go into them all here, but all submissions are visible to the public on Google Code, the table below has links to each student's contributions. blender...web.de collective.portlet.links Create a Plone 3 portlet that lets site administrators create a list of links and have them appear as buttons. evan.carmi Produce a report on the pages on plone.org that are outdated or misleading in light of the recent Plone 3 release. For the tasks that involved contributing code such as the themes and portlets these are available on the collective and PyPI under the package names given. Thanks to all of our wonderful contributors and Google for sponsoring this. In addition to the cash and t-shirt based prizes each open source project nominated one grand prize winner who will attend an award ceremony at the Googleplex. Our winner, Jonathan Wilde (speedbre...aton.com above) happens to live near the Googleplex so stopped by at the Strategic Planning Summit last weekend. 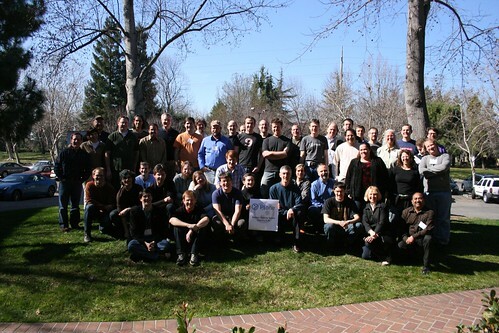 Jonathan Wilde, centre; Plone people, everywhere else.